Breathing is what’s keeping us alive. The exchange of oxygen and carbon dioxide between the body and the environment is one of the most essential processes of life. The lungs being responsible for this process are more exposed to diseases, infections and the like. Every time this happens it is mandatory for health care professionals to do a thorough pulmonary examination to be able to assess and diagnose the specificity of the lung ailments. This is very essential in order to know the proper treatment or therapy for the disease. The pulmonary examination has four components these are: inspection, percussion, palpation and auscultation. The Inspection component primarily involves the observation of the respiratory movement. There is a lot of vital information you can gather about the respiratory status by merely observing the client’s rate and breathing pattern as well as the depth and symmetry of lung expansion. Additional information can be gathered through palpation. 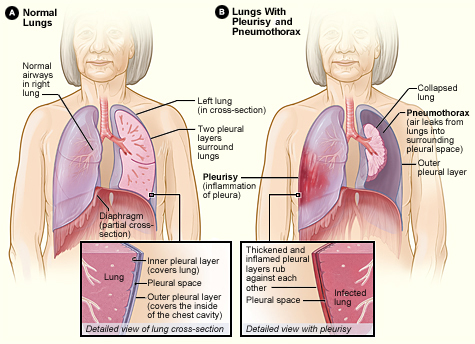 Palpation of the symmetry of lung expansion confirms the findings observed by inspection. In addition, palpating the vibration produced by spoken sounds which are transmitted to the chest wall may indicate the presence or the absence of symmetrical tactile fremitus. Percussion on the other hand helps assess the resonance or dullness of the tissues underlying the chest wall. Resonant is a normal finding upon percussion of the underlying air-filled lungs. Another component that is very essential during pulmonary examination is lung auscultation. Lungs auscultation involves the use of a stethoscope and listening to both lung fields. The examiner auscultates the quality, intensity of breath sounds and listens to the presence of other adventitious sounds that may indicate abnormal findings. A normal breath sounds are known as vesicular in which the inspiration is louder and longer compared to the expiration sound. There are different adventitious sounds that indicates differ lung problems. But there are two abnormal breath sounds that are usually confused with each other. These are the Rales and Rochi, they may indicate lung problems but knowing the difference between the two will help you distinguish what specific disease these breath sounds indicates. So what are the difference between Rhonchi and Rales? Read on. Fine rales are commonly heard among clients with underlying respiratory disease. It is also known as “crepitant rales”. These are fine delicate sounds like the sound produced when few hair strands are rubbed together – crackling. They occur in the small passageways, the alveoli and the bronchioles and are more prominent at the end of inspiration and are not usually cleared through coughing. Medium rales occurs in the large passages of bronchioles and small bronchi. They sound like the “fizz” from the recently opened carbonated drinks. Coarse rales are heard over the large airways of the trachea and the bronchi. They are relatively loud, bubbling and gurgling sounds. They clear partially during coughing and frequent heard from patients who have negative cough reflex thus allowing thick secretions to accumulate in the trachea and the bronchi. Coarse rales are auscultated among dying patients that’s why it is also called “the death rattle”. Rhochi are sounds created when there is a free liquid in the airway passages. The interaction between moving air and create a high or low pitched vibratory sound. This adventitious breath sounds are produce regardless of the cause such as exudates, spasm, or inflammation. These sounds are present in both phases of respiration but are more prominent during expiration. This is classified into two depending on the pitch they produced. Sibilant rhonchi are high-pitched vibratory sounds produce in the smaller bronchi and bronchioles. It is wheezing or squeaking in character auscultated more during forced expiration. Sonorous rhonchi are low-pitched vibratory sounds that are produce in the large passages of the trachea and the bronchi. It is snoring or moaning in character and are usually classified by clinicians as coarse rales or vice versa. They can be partly cleared by expectoration of secretions through coughing. These and more adventitious sounds are of immense clinical importance in the diagnostic and treatment process. Proper pulmonary examination and subsequent knowledge regarding the difference of these breath sounds can lead to proper medical management that helps client with respiratory disorders. Jade Sison. "Difference Between Rales and Rhonchi." DifferenceBetween.net. February 11, 2015 < http://www.differencebetween.net/science/health/difference-between-rales-and-rhonchi/ >. Could you have a recording of each sound? That would make it easier. What I’m having trouble with is the sounds. They both sound the same to me.